this is NOT the extent of either SEO or keyword research. Both are rabbit holes. blogging is a process and so is building a business. 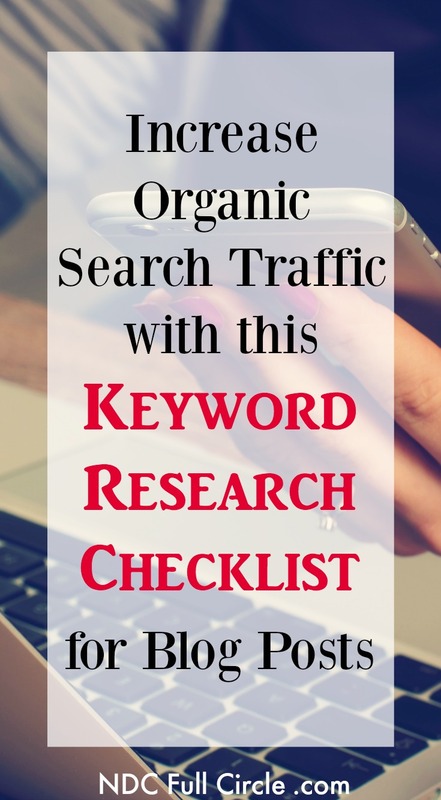 If you haven’t been doing keyword research, start today. You can add one top-performing post a week to make this manageable. The data your site’s backend can give you is critical for your site’s keyword research. I recommend two resources to learn more about what YOUR site’s backend data can tell you and setting up your site for SEO success: Skyrocket and Dominate. 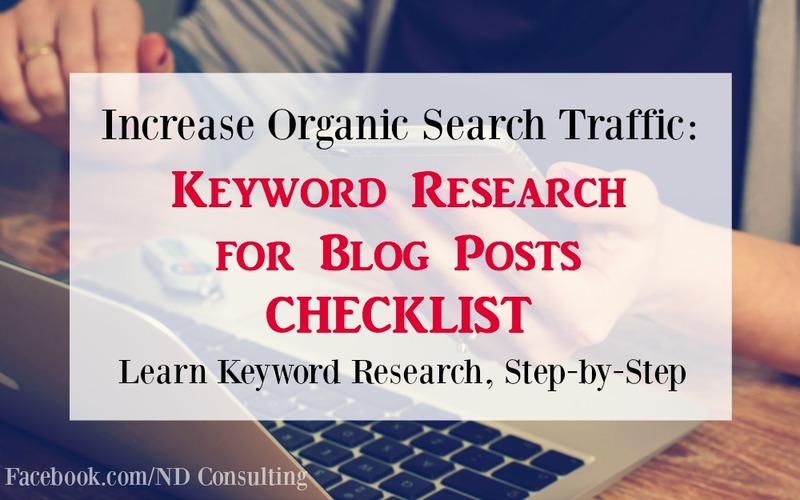 The following steps take you through a quick process on how to research keywords for blog posts. 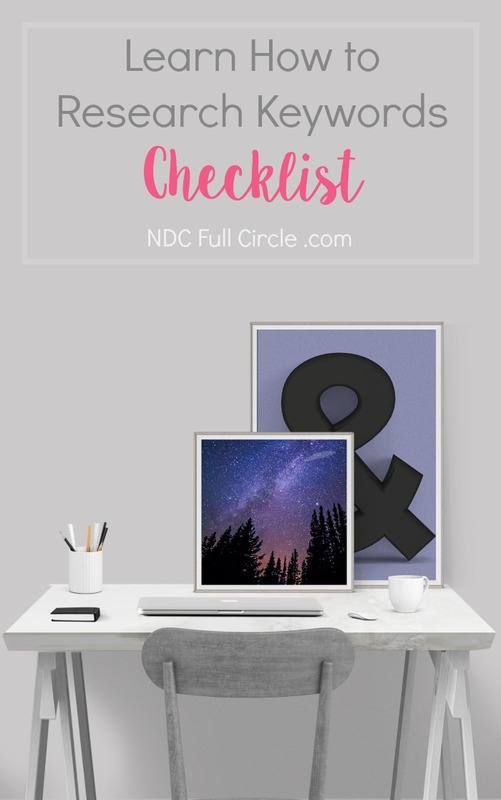 Get a quick and clean checklist if you’re a subscriber here. If you’re not, just sign up below for my popular once a week tip sheet. Does the reader get something (inform, solve a problem, provide a checklist, etc.)? What are people ASKING for in this topic? If you’re following your work in Identity and are performing market research, the keyword process starts there and inside your analytics. Is the keyword relevant to your site’s content? Is it a phrase a reader would SEARCH for? Would they type in your phrase or something else? If people come to your site for this article, will they get what they wanted? Example: The search results for a roundup article of DIY sock tutorials would be inline with the rest of the content on my craft site, Ruffles and Rain Boots. The search phrase (and alternates) could be searched by someone interested in crafting a handmade toy from socks, and the article would provide a great starting point for someone seeking sock toy ideas and tutorials. Check the search engine results pages (SERPs) and keyword tools. You can use Google, Bing, or any search engine your audience is using. Ask yourself: are there a high number of ads? If so, consider finding something else because it means there is a high competition rate. For this example, there are no ads on this particular short-tail keyword, so I will continue. If there are a few, you can continue or seek alternates or get more specific (DIY sock toys for dogs, for instance). If there are many ads, you will likely have a hard time ranking BUT you should try to narrow it down even further with your long-tail keyword. Next, use keyword search tools (KW Finder, Moz’s Explorer, BrainstormIt, Jaxxy, etc.) 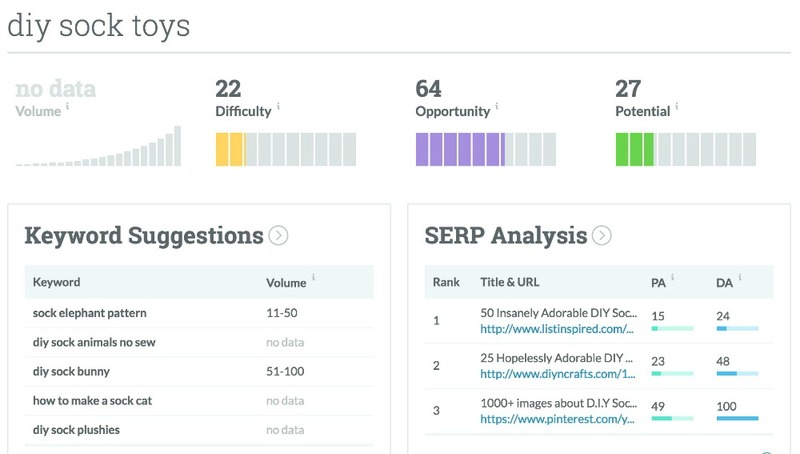 to find keyword tools scores, the potential for ranking, and alternate keywords. For our example, I used KW Finder and MOZ’s Explorer (both offer some searches for free). There is an opportunity for me to get a bit more detailed to improve my odds and per Moz’s tool, the difficulty is low but so is the potential. If you want to learn more about latent semantic indexing and the clout it is given, search your heart out. The quick and dirty explanation: alternates matter when you research keywords for blog posts. Go into your favorite tool (mine is Buzz Sumo) and try to find a high-ranking related article using your keywords. Read it thoroughly, and if it fits, link to it naturally. If not, seek out an alternate keyword article that ranks well or begin searching for your long-tail keyword. The drop down menu in a search engine (pictured above in Step 3) is one place to check. Use the search bar in Pinterest for your keyword and see the alternates (also useful if done in YouTube’s search for videos because it is a powerful search engine). Look at the bottom of the first page of the SERPs for alternative keywords. Think about what alternatives you would search for on the topic and/or ask your readers with a quick poll on Twitter or Facebook. Let them help you to help them! I’m going to reference my popular SEO in-post checklist. Contrary to popular belief, “getting green lights in Yoast” isn’t practicing “good SEO” or performing keyword research for blog posts. If you’re new, it’s a start to get you thinking about your format and ratios but it cannot be your only focus. One thing I’ll pull out of the checklist is titles and headings. Stuffing them with keywords is not the goal – creating inviting, informative snippets is. For this article, below are the actual results from my work in CoSchedule’s headline analyzer (free). I’ll use these for social media share prompts, references in past and future on-site links, and even title changes for this post. I write and prep all articles in OneNote, so I add in a screenshot. And here is my title and headline research for our example article. The original title (from the seller of the roundup) was the first one, “Hopelessly Adorable…” This shows why this quick exercise is worth your time. There is a lot of variance with this one so I’d just like to say: do what you can. Set up your social shares in a tool like CoSchedule and make it easy on yourself! Pinterest – this isn’t strictly for SEO, but create a board if the topic warrants and link back to the article as additional reading. This practice helps with curation and offers alternatives to readers. Curation – seek out other articles and comment on them after your article goes live. Share them on social media and add additional content to your Pinterest board, if applicable. Use your keywords and alternates in your social shares. Images – when creating images for your article and social shares, consider using both your keyword and alternates in the text and descriptions. For our example, I created a board on Pinterest to support the article and have included variations in my social shares to incorporate the keywords and their alternates. This keyword research checklist is a good start to learning more about what you could be doing to improve your blog’s standing in search results. I always point clients to this beginner’s guide to SEO article because it’s an amazing resource. Assign yourself a chapter each week and you’ll reap benefits. Mentioned above, Skyrocket and Dominate are affordable options to targeting specific actions for your site. If you have questions about these, please let me know. A final piece of reading I’ll direct you to is this article on keyword planning to get started with site SEO. 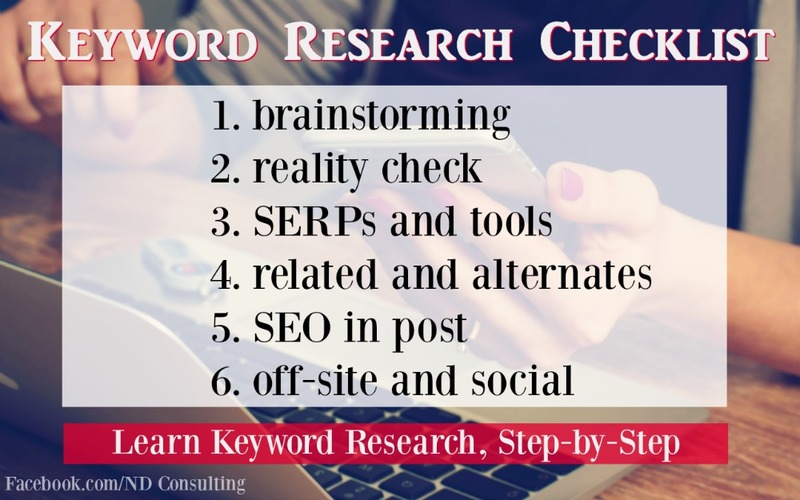 Get the “Research Keywords for Blog Posts” checklist in the Resource Library or sign up and grab the SEO Checklists for Blog Posts while you’re there. Between these two checklists, you’ll begin to develop your site’s SEO strategy and practice. Please Pin this to your Blogging 101 or Tribe Education board on Pinterest! It will definitely pay off, Audrey. In the beginning, it takes a while to truly find the time to focus, but once you do… What that organic traffic increase!! I can’t thank you enough for all your tips, Sarah. I’m still crawling my way to effective SEO, but I’ve already learned a lot with your tips! Thanks, Debbie – and crawling our way to effective SEO is what we’re all doing. The search engines certainly keep us on our toes! I’m so glad you’re finding the keyword research tutorial effective, Heather. When I first started blogging, I just wrote. Then, as the search engines became more focused on the user, it forced our hand a bit to get better at identifying what a user could be looking for.